It is MFA thesis show season, and I've had the pleasure of going to quite a few amazing shows, as well as looking forward to a few as well. 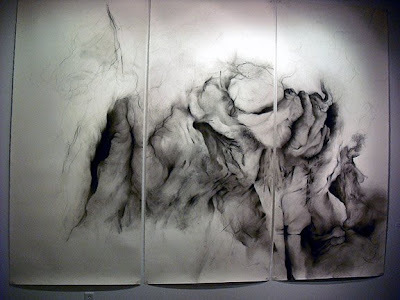 This piece is from Anna Kenar, and I love it: I have developed a love/hate relationship with charcoal after teaching life drawing this semester, and this piece definitely falls into the 'love' category. I've been plugging away on my lace painting as well. I had to re-do what I had done the first round of painting because I didn't like how bright I had painted it. So I re-did that section in a more natural tan color. Much better. wow!! that charcoal is gorgeous, and I still love that lace painting!